Marital discord followed this shift in phone behavior. When one of the kids finally called, we got on the phone together. Big mistake. She hated it when I interrupted to make boy-centric cracks. I hated having to hold the reciever away from my ear when she spoke. Bickering and changes in sleeping arrangements followed. So, I’m done. No more racing across the house to get to the phone first. No more wrestling my partner for the receiver. 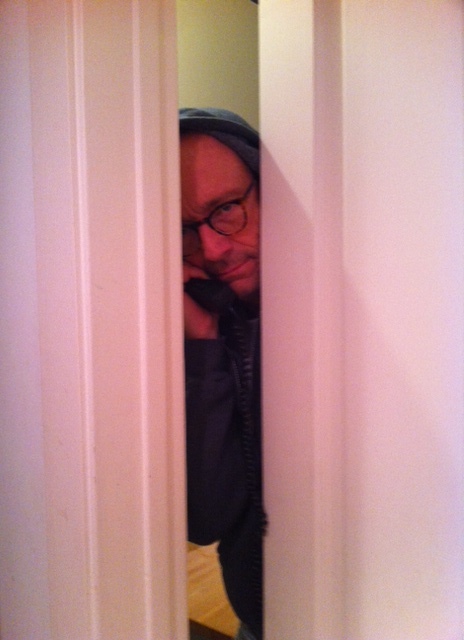 From now on, I’m going with covert calling. Shut the office door. Dial up the offspring and have a lengthy and fulfilling conversation that I can gloat about over dinner. This entry was posted in Empty Nest, Partnership by Sam. Bookmark the permalink. Brilliant! Know the drill. And we’re still married! Thanks, Bill….I’m still learning the drill, 27 years later! Use Skype. They’ll pick up cuz they won’t know it’s you. Of course! Going to try that immediately. I can totally relate! I have come to dread the group skype. Aidan talks over phil and I, then phil and tim start talking endlessly about some sports crap, then I just sneak out. Now I just call Tim from my office. That is so funny. I throw something about the Chicago Bears (our team), Anna wants to stay on point about classwork, and expenditures. Then Anna or I say “This is my call!”, then it all goes south. One word: Google Hangouts. Oh wait, that’s two words. But it rocks. You can both talk, both hear everything. And it’s free, and more reliable that Skype. What’s not to love? Thanks for the tip, Karen From Google! (just kidding) We’ll give a try. Your boys are so fortunate to have you guys as parents – another piece of brilliant writing Sam! Me: Please get a flu shot! Spouse: An $80 charge for car towing!?! 1) Freshman year it was all about reinventing yourself, creating a New Nest, sleeping non-stop the first days home on break, then being irritable because you have gone cold turkey from ready access to friends 24/7 . Parenting tips: Send any monthly allowance allotted for expenses ON TIME, send care packages, send handwritten letters, visit to take offspring and key friends out to dinner and decline any reluctant invitations to join the party afterwards. Let them sleep when they are home. Deep breathe. (Start giving offspring a key cooking utensil and home owner’s tool each birthday and significant holiday). 2) Sophomore year it was all about questioning the value of a college education (“Wouldn’t I be better off shucking the confines of classroom protocols and trekking the Himalayas instead?”). Parenting tips: Send any monthly allowance allotted for expenses ON TIME, send care packages, send handwritten letters, and encourage offspring to explore summer “mission trips” that offer college credit. And this is key: LISTEN but do not offer advice unless they are begging and screaming for it. (Give offspring a key cooking utensil and home owner’s tool each birthday and significant holiday). 3) Junior year was all about reevaluating core beliefs, nurturing meaningful relationships, and discovering the joy of producing excellent work in upper level classes. Parenting tips: Send any monthly allowance allotted ON TIME, send care packages, send handwritten letters, visit to take offspring and key friends out to dinner and accept the heartfelt invitations to join the party afterwards. Do NOT ask offspring or friends about their career plans. Start sharing your best techniques re life skills via a computer document: budgets, insurance, how to save for major purchases and expenses…intersperse with humor but Do Not lecture. 4) Senior year it was all about feeling on top of the world and terrified of the world, feeling nostalgic and full of promises to stay connected with friends yet feeling like a lone ship about to set sail out on a vast ocean. Parenting tips: Send any monthly allowance allotted for expenses PLUS an occasional bonus ON TIME, send care packages, send handwritten letters, offer to visit but do not be offended if the offer is declined (every last moment with friends and favorite professors is gold to them). Be prepared to drop whatever you are doing to help offspring move out of the dorm and into his/her first apartment or shared home after graduation. Do not cave to knee jerk reactions when offspring call in a panic to tell you they are broke, lonely, disheartened, or clueless as to how they should proceed. LISTEN, LISTEN, LISTEN and reassure them that they are competent and resourceful, that no matter how difficult it seems, no matter how small the steps they take to move forward, they will succeed. Reassure them that in the event of a job loss, a need to evacuate a home due to flooding or eviction, or if they are ever in need of tender loving care in the midst of a major health crisis, they are always welcome to come home TEMPORARILY to recover. 2) When offspring call, take turns answering the phone first. this is the best!!! We are in the sophomore year part, and deep into the questioning of the value of college education. I will print this out and save for future reference. A touchstone for sure. Hahaha, thanks. Wish I had thought of the practical gifts on holidays a bit sooner with my girls. Really wish I had learned “life skills” in college myself! Tim is actually quite a good cook and he called yesterday to tell me that he’s taking a personal finance class in May term. Be still my heart. Wow, Maria. I had no idea what an amateur I was until I read your comment! Awesome advice, though I’ve never been terrific about the care packages. Going to have to hone my baking skills. Sam, hahaha, I was not always as clear and focused throughout the girls’ recent college years! I do believe kids need a chance to struggle and sort things out on their own as much as safely possible though. Now I know how to get you to answer your phone…just impersonate one of your boys! What I meant to say is that I only pick up for the boys and Stacy.